Speakers’ Corner in Hyde Park is found close to the site of Tyburn gallows, where public hangings took place between 1196 and 1783. Legend has it the origins of Speakers’ Corner lie in the tradition of granting last words to those condemned to die. 80 years after the last hanging took place at Tyburn, demonstrators agitated for the right to meet freely in the park. In 1866 police, 12,000 special constables, and military reinforcements attacked a banned meeting of the Reform League, who demanded the vote for men. Finding the park locked, demonstrators tore up hundreds of yards of railings to gain access, and three days of rioting followed. The next year, when a crowd of 150,000 defied another government ban, police and troops did not dare intervene. Spencer Walpole, the Home Secretary, resigned the next day. Finally, the 1872 Parks Regulation Act established the right to meet and speak freely in Hyde Park. By the 1930s “soapbox” orators were to be found in marketplaces, street corners and parks across the country. 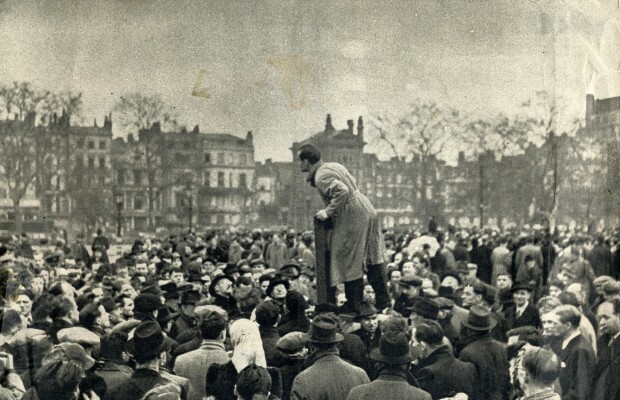 Of the estimated 100 speaking places established in London between 1855 and 1939, Speakers’ Corner is the last to survive, perhaps because its location in Hyde Park is so central and has always been a focal point for protest. Speakers’ Corner hosts “meetings” of various kinds. There has always been a mixture of religious, political and entertaining gatherings to choose from. 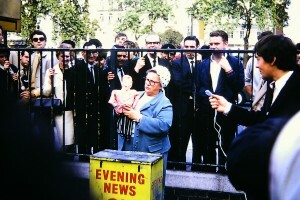 The subjects discussed at Speakers’ Corner to some extent reflect the changing preoccupations of the day. The platforms of the 1940s, for instance, included the Connelly Association and United Irishmen, the Communist Party, the Socialist Party of Great Britain, Indian nationalists and African speakers. Anti-colonial platforms were mounted in the 1950s and 1960s, while during the 1980s and 1990s new platforms emerged that reflected the rise of minority politics in Britain, including the Hyde Park Gays and Sapphics. A new generation of young black speakers arrived, inspired by the older generation who had arrived from Commonwealth countries in the 1950s. While political speakers continue to expound their views at Speakers’ Corner to this day, the multitude of party political platforms are gone. Over time the balance has shifted and there are now fewer political and more religious meetings. Increasingly the loudest debates are between evangelical Christian and Muslim meetings. Every Sunday, against all the odds, speakers, hecklers and crowds continue to gather in Hyde Park. For more detail see the Speakers’ Corner timeline. 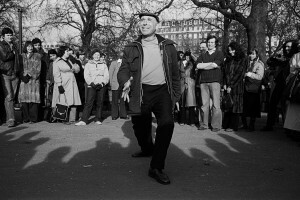 The Speakers’ Corner Trust has created a national network of local Speakers’ Corner projects in places like Nottingham, Lichfield, Brighton and Reading – many of which had traditions of outdoor oratory in the past. Visit this website for more details and to find out about their educational and international work.